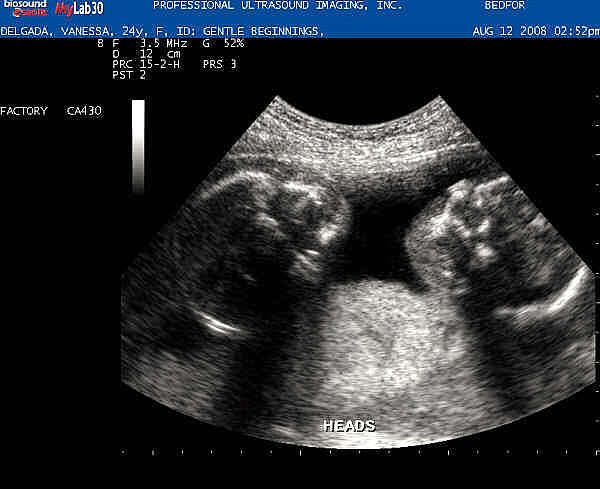 We went to the midwives office on August 12th 2008 for our first sonogram I was already 19 weeks and we couldn't wait to see our baby. Jason, Destinee, Kenya, my Mom (and of course myself) were all there. Kenya was so cute she kept saying "baby mommy belly" I think she understood that the baby on the TV was the baby in my belly. As the sonogram guy Kevin was doing the sonogram I kept seeing another head so I ask, "Is that another head?" Kevin said, "Yes." I said, "We are having twins?" he said "Yes". We were all so excited! I remember saying, "I have always wanted twins" and Dee (my little sister) kept saying "Your having twins!" So then the doctor came in and started doing his measurements he began to explain to us where they were conjoined and he told us that they shared a liver which wasn't a big deal but that they also shared a heart so we would not be able to separate them. We said ok we were already prepared to hear that I had already been thinking all week about the stuff I could invent for them to play in so they wouldn't always be laying down. Then he started explaining more about their heart; it only had one ventricle which wasn't enough for one baby let alone two. He said I would most likely have a miscarriage but if I did make it to full term that they wouldn't live long after birth because their chest cavity was underdeveloped which meant that their lungs most likely wouldn't develop. So he said whenever I went into labor they would deliver the babies by csection hand them to us and let us hold them until they passed away. I couldn't believe it I asked him a few questions then lost it. I was still comforted in knowing that God was in control but no parent wants to ever hear that. We were so excited about our babies and just fully trusted the Lord Jesus Christ, He was and is our hope. We know that His ways are far better than ours and He is completely sovereign over all things! 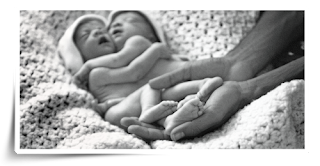 This did not surprise Him, He allowed it to happen, and even ordained it to happen, this is His will,... for our good and for His glory and we are just so thankful that He gave us these babies! I ended up going into labor on November 11th 2008 and our babies lived for an hour. We got to spend a lot of time with them and make a lot of memories with our sweet babies. God used our babies lives for His glory and our good and we are so thankful to be their parents.